The Blues (26-22-5) are not only winning games regularly now -- they're 9-2-1 the past 12 games -- they're beating good, quality teams. 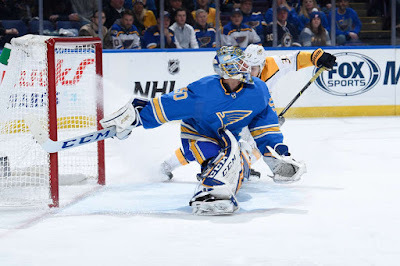 ST. LOUIS — ST. LOUIS -- Not long before the Blues played their last home game before Saturday (Jan. 19) against Ottawa, there had been a different vibe in the locker room, one that was trying to gain confidence but had a tough time because of the inconsistent play. That seems like such a long time ago, because the Blues seem to have their swagger back, and it's come just in time. Ryan Ellis on Saturday in the Blues' 3-2 win at Enterprise Center. And the Blues (26-22-5) are not only winning games regularly now -- they're 9-2-1 the past 12 games -- they're beating good, quality teams. And they keep doing it against top, quality teams like the Predators (33-20-4), who are one point out of first behind the Winnipeg Jets in the Central Division. The Blues topped the top team in the league, the Tampa Bay Lightning, 1-0 in overtime on Thursday. So how are the Blues doing this? Well for one, goalie Jordan Binnington is making saves and winning games. He's 9-1-1 in his 11 NHL starts and is giving the Blues a chance to win on a nightly basis. But bigger picture is the team structure. They're chipping pucks in and going to work, wearing down opponents, the defensemen are tighter in coverage and able to transition pucks cleaner. "We're just building as a team," said Blues forward Pat Maroon, whose fight with Nashville's Cody McLeod in the first period was a booster for the bench. "The chemistry around the room is unbelievable. You can see it on the ice. The boys are just playing the right way. Every line is chipping in at the right time." 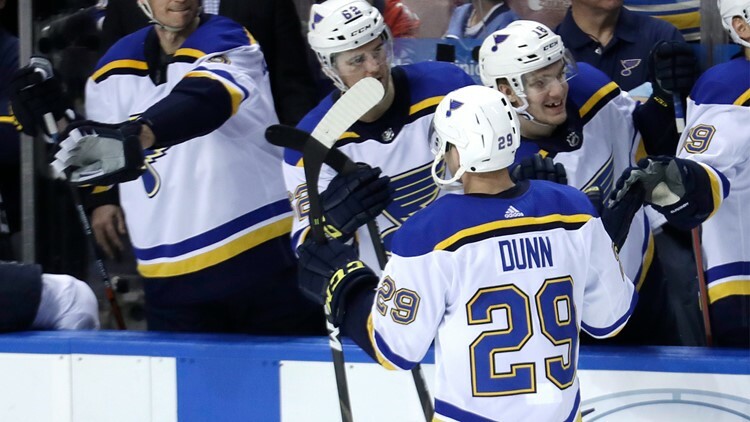 The Blues established their game early in this one and despite the proverbial taking their foot off the gas in the third period protecting a 3-1 lead, confidence is not near an issue now and it's oozing. "I think it's just confidence right now," Dunn said of the winning streak. "Everyone's really happy with how everyone's playing. We're really supportive of each other on the ice, off the ice. I think when the team's playing as a whole, it's really easy for us to be successful. Guys are getting points when everyone's working together." "Everyone is working together," Dunn said. "We're picking our spots (as defensemen) to jump in the rush. "... Thomas made a great play finding me high and I was able to find it in front. But right from the start, Patty really got us going with that fight." 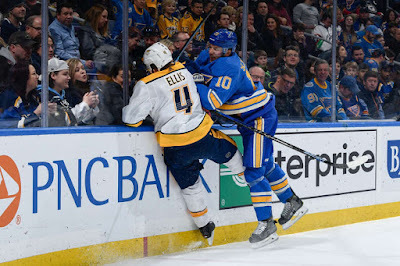 It was the workmanlike efforts of the line with Ryan O'Reilly and Brayden Schenn, after Schenn intercepted a play in front and made a sweet backhand feed to Tarasenko in the quiet spot on the ice. "It's really important for us," Tarasenko said of the Blues' quick start. "We don't play at home for a long, long time. Especially against Nashville, this is a big test for us. "We try to create some offense from the rush sometimes, but sometimes it's just simple plays and it gives us success. We have to do it more. Brayden and Ryan are good players." Ekholm's power-play goal, Nashville's second in the past 12 games, cut the St. Louis lead to 2-1 at 7:28 of the second period to give Nashville some life, but it was short-lived when MacEachern's second NHL goal made it 3-1 at 10:58 of the second on another rebound. MacEachern, who signed a one-year, one-way contract extension for $750,000 after the game, as announced by the Blues, was in front and finished off Ivan Barbashev's two quick shots on Rinne. "If I stay with it, I think I can keep building off of that," MacEachern said. "Our line has had a handful of chances the past couple games, so it was nice to put one in there. to 9-1-1 in the NHL after a 3-2 win against Nashville on Saturday. "[Thomas] made a nice play and Barby kept whacking away there and fortunately enough, it kind of squirted away and I banged it home, felt good." Johansen's goal with 1:15 remaining in the game cut the Blues lead to 3-2. "You can see we're doing the things that it takes to win hockey games," Maroon said, "and it's turning into a fun little streak here."